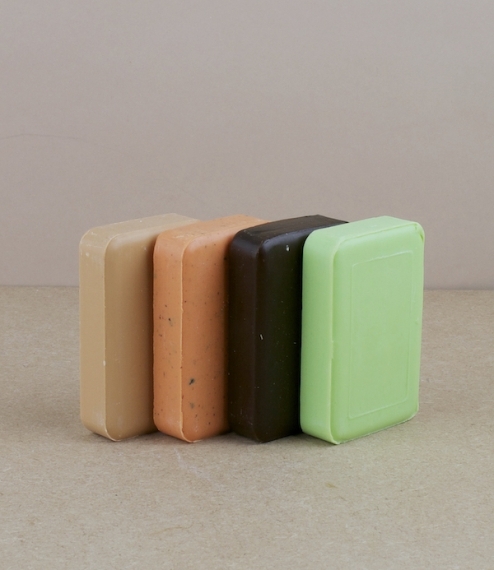 Handmade vegetable soap from the town of Vaasa on the west coast of Finland, with added pine tar, tea tree oil, or sea buckthorn. The pine tar soap is deep brown in colour and imbued with the scent of resinous woodsmoke - pine tar being the liquids exuded as pine roots and stems are slowly heated to the point of carbonisation. The rich cappuccino lather is gentle on the skin and said to possess mildly antiseptic qualities. Tea tree oil is well known for its antiseptic and astringent action as well as its ability to aid in the purification and healing of infected and irritated skin. A stimulating and refreshing morning soap. The sea-buckhorn soap is made with fragments of the dried plant, its berries, and seeds, lending it a mildly exfoliating texture. An astringent, sea-buckthorn is also known for its anti-inflammatory properties, and ability to calm problem skin. It possess also something of the scent of Finland's coastal wilderness. 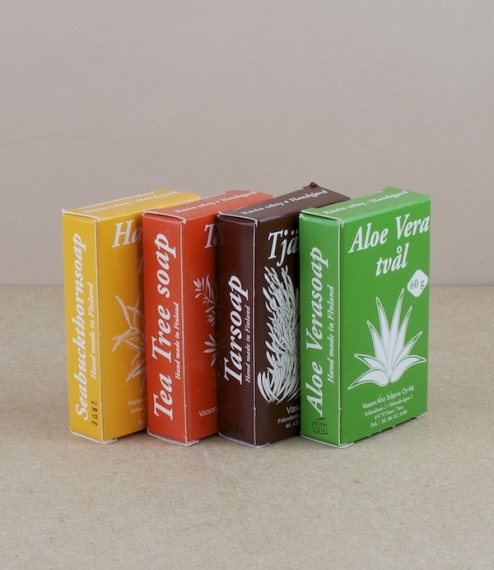 The aloe vera soap is known for its soothing and calming properties being a gently moisturising and softening soap with the typical aloe scent - an ideal face soap, or aid to drying hands.